Click into the input box labeled "Enter your poll". 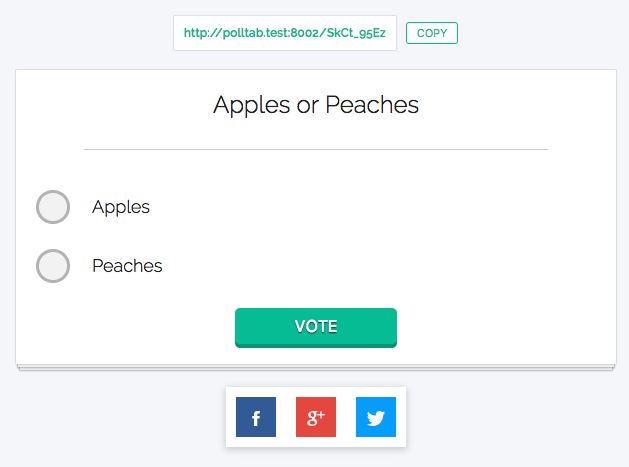 As soon as you start entering your poll question you'll see a live preview of how your poll will look like. 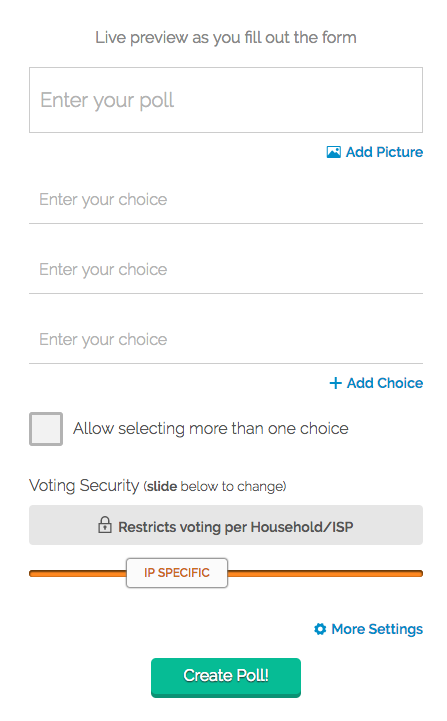 You'll notice an "Add Picture" option on the bottom of the input box labeled "Enter your poll". This will enable you to add a picture to your poll that will appear below your Poll question. Currently, we also support a youtube link, if you add a youtube link the video will be embedded below the poll question. Once you finish adding your poll question, simply click on the next line labeled "Enter your choice" and start typing in the choices you like to have for your poll. You can add more choices by clicking on + Add Choice, or if you fill in all three choices a new choice line will appear automatically! Currently you may have up to 150 choices! By default the poll only allows each participant to select one choice, If you like the option allow participants to select more than one choice you can simply check the checkbox labeled "Allow selecting more than one choice"
This allows votes per browser as its cookie based. Requires the user to login to their specific accounts before they can cast a vote. 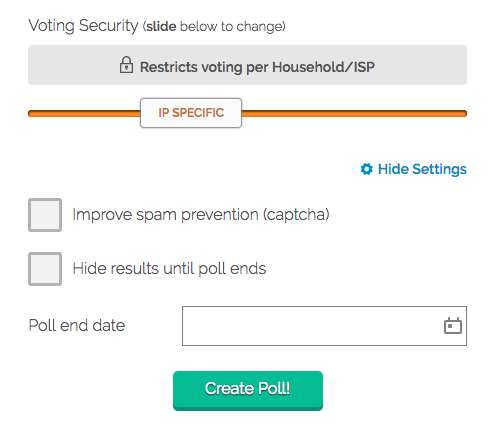 To learn more about voting security, how each vote is stored, and how you can improve your poll security please read our article on polltab voting security. Once you finish entering your question and choices, you can press the "Create Poll!" button. This will create the poll and direct you to the poll voting page. On this page you'll notice a special link above the poll that you can send to your participants. There are also social share buttons on the right side of the poll that can be used to share the poll on social media such as Facebook, Google+, and Twitter. This will enable a captcha box that a participant must verify before they can cast a vote. This helps with spam prevention and participants who try to game the vote. This option will hide the the results of the poll until a specified end date. By default all polls will show the results once a user cast their vote, turning this option will direct voters to a countdown page showing a timer on when results will be announced. If you set a Poll end date, it will lock the poll down from further votes once the poll ends. If you do not set an end date the poll will be consider a poll that last forever. If you having problems creating a poll or have questions about creating a poll on polltab, please contact us.